Engaging with citizen-generated data is the next step in Amnesty International’s ongoing campaign against human rights violations worldwide. Here, Amnesty’s senior innovations campaigner Milena Marin outlines campaigns including ‘Alternative to Clicktivism’ that show how the organisation plan to work with the forthcoming generation of technologically-proficient citizen activists. The volume, type, and sources of information about human rights violations has expanded considerably, leaving researchers with information overload. Real time technologies have meant that human rights violations can be rapidly exposed. New technologies present us with limitless ways that people could engage with our work. Our campaigners, faced with a sense of these opportunities, are challenged to come up with better tools for engagement. To date, standard practice for human rights activism online involves sharing information on social media, signing petitions or providing financial support – but this level of engagement is no longer enough. New technologies present us with a tantalising opportunity to harness the power and energy of the crowd; to involve others in analysing evidence of violations and to enable them to experience the scale of the problem. That’s the challenge. However, the next generation of activists is also digitally savvy, with ready access to technology, and a strong desire to make a difference. With Amnesty International, I am exploring how new technologies can inspire this next generation to engage in human rights work. Over the next two years we will pilot technologies and methodologies for activists to become ‘Human Rights Monitors’. These ‘Monitors’ will participate in documenting human rights violations, helping Amnesty International and all human rights organisations tackle today’s information and research challenges. In seeking to integrate citizen-generated data gathering into our research processes, our fundamental assumption is that there is a global community of supporters who are ready and willing to scale up their contribution. Examples from the sectors of humanitarian response, biology and science show that many people have a genuine desire to contribute towards the ‘greater good’, and that new technology applications make it easy for anyone, local or global, to pitch into a common effort. Our dream is that anyone with an internet connection and a drive to make a difference could contribute in real time when a human rights crisis unfolds. This is a radically different approach to our standard research methods. Amnesty International is well known for its rigorous, impartial research carried out by thematic or country experts, who conduct in depth studies and present objective results to the public. With the ‘Alt Click’ project, we want to flip this approach and turn our readers from consumers of information to participants in the analysis, validation and collation of evidence. We plan to do this without losing our research rigour. Amnesty has more than seven years’ experience using technology for documenting, collecting data and exposing human rights abuses. This includes extensive usage of remote sensors 1See here for examples of usage of satellite images to expose human rights violations: Nigeria: Satellite images show horrific scale of Boko Haram attack on Baga, Documentation of the carnage in Rafah during the 2014 Israel/ Gaza conflict or Satellite images show Hungary’s rush to keep refugees out of Europe. and other open source intelligence 2For example, the Citizen Evidence Lab is intended to support human rights researchers and advocates to better take advantage of the new digital data-streams emanating from conflict zones to complement traditional research and work in places that are either inaccessible or too dangerous for our researchers. This work has thus far been carried out by expert analysts, but involving other people in these projects could make our research more efficient. 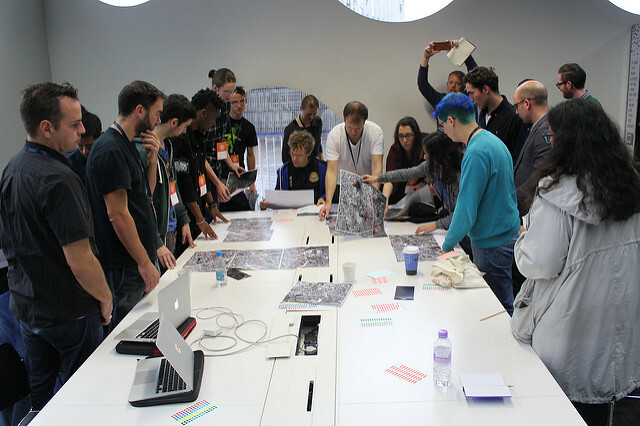 For example, analysing satellite images for human rights investigations can take a researcher anything from days to weeks and months, depending on the area of interest and the detail sought. Through using available micro-tasking technology, we can engage large groups of people to scan small parcels of satellite imagery for an item of interest such as a tank, a crater or an oil spill. Micro-tasking is the process of splitting a large job into small tasks that can be distributed over the Internet to volunteers or paid contributors. In the commercial sector, this process has been in practise for over ten years. Micro-tasking ‘workplaces’ such as Mechanical Turk or ClickWorker connect people all around the world with businesses that want to outsource work e.g. tagging photos from social media, using a photo to type out business card information, digitising receipts and invoices, etc. The Mechanical Turk service from Amazon has a particularly telling name. 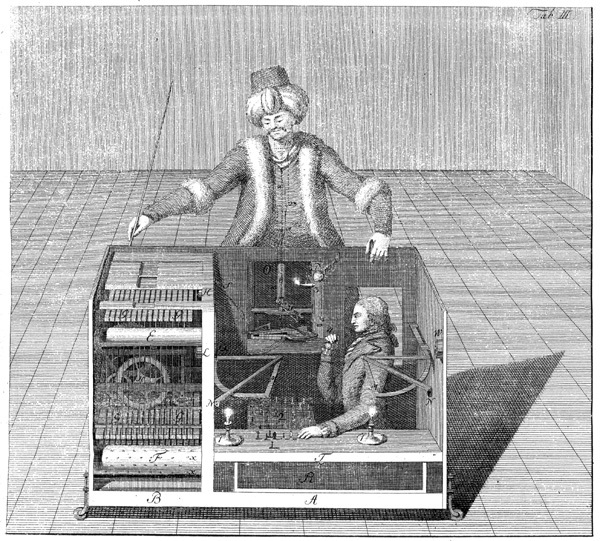 The original mechanical turk was a (seemingly) groundbreaking invention of the 18th century – a chess playing machine that could defeat human players. However, this proved to be an elaborate hoax , an illusion which masked the human chess master inside, who was operating the machine! This story is a good example of the way in which human intelligence still trumps machine labour for performing certain tasks, and also explains why organisations are increasingly turning to micro-tasking. Computers and algorithms are very good at certain sorts of tasks, such as identifying patterns in an image or spelling errors in a text, processing raw data and performing advanced calculations. However, they are less able to perform other tasks, such as detecting context, irony, understanding positive or negative bias in an article, accurately recognising what is in an image or video. Increasingly, micro-tasking technology is being used by the nonprofit sector to tap into crowd wisdom and solve complex, large scale problems. These problems cannot be solved by machines and algorithms. Examples of such applications range from tools to extract data from images of disaster and accelerate damage assessments such as GeotagX, Micromappers or Planetary Response Network, to identify deforestation, forest degradation or fires and haze with the Global Forest Watch Fires or to digitise public documents through La Nacion’s VozData. Through ‘Alt Click’, the project I lead, which stands for ‘Alternative to Clicktivism’, we have the opportunity to test whether micro-tasking can help Amnesty International engage with a wider audience on the documentation of human rights abuses. Next year we will launch pilots that test out a number of different tools and approaches, and invite people to help us with challenging tasks. As shown in the table above, there are numerous opportunities to join in our work. However, while micro-tasking has already been used widely in sectors like humanitarian response, implementing similar initiatives in the human rights sector presents its own distinct set of challenges. First of all, the content available to human rights researchers is often sensitive and sometimes highly graphic. Sharing this data with the wider public poses immense ethical challenges. We need to take serious steps to ensure that no harm comes to those who choose to engage with Amnesty’s work. In addition, we are concerned with ensuring the validity of citizen-generated data, not to mention the potential for a small number of contributors to skew the data with false contributions for political or commercial reasons. That’s why we are partnering with experts including the engine room, the Responsible Data Forum and Aspiration Tech. We plan to adopt an open documentation approach and share our learning as we go. If you are interested in knowing more as the project gets off the ground, subscribe online for updates.